Go behind the scenes of a prominent plastic surgeon's RTW 2014 collection. WomansDay.com is sharing our sister magazines’ coverage of New York Fashion Week, which runs from September 5 through September 12. We hope you enjoy this post from Cosmopolitan.com. One of the last shows of this season’s Fashion Week in New York was notably inclusive of men and women of all body types, ethnicities, and ages. It was also notably inclusive of “before” and “after” photos. Of their plastic surgeries. Celebrity plastic surgery master Dr. Ramtin Kassir and his clever public relations team were behind “Faces of Beauty,” an all-cosmetic surgery showcase. 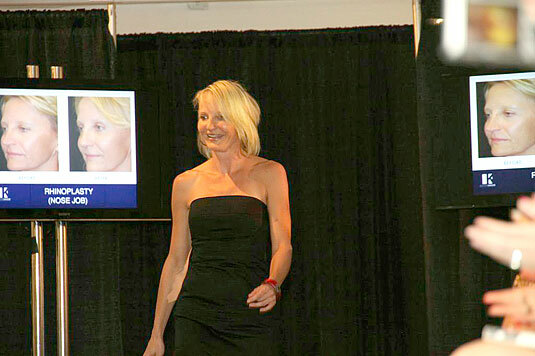 Behind the models walking the runway were screens that stated the name of each procedure along with the images that illustrated their transformation. The concept somehow falls into that category of things that are shocking, but also not shocking at all — in the age of Bravo, corrective surgery was destined to become “ready to wear” at some point. You have to wonder if the haute couture version is on the horizon, and if so, what that would be like. Dr. Kassir’s goal for the show was to dispel Hollywood stereotypes of people who go under the knife (from Janice Dickinson to Billy Crystal) to and prove that plastic surgery is accessible to you, me, and Dupree. Anyone who wants a nose job, basically. The real irony of Faces of Beauty was that the crowd looked like they’d had more work done than the models. Was this to Dr. Kassir’s credit? Some of the more normal-looking audience members were family members, there to cheer on their surgically-corrected loved ones. Otherwise, the room was full of the jewel-toned bandage dresses and bedazzled shoes of women who get photographed at events for ambiguous reasons. (At least 50 percent of them aspire to say “I’m not here to make friends” into a camera.) The only young men in attendance were the security guards. The front row was devoid of Anna Wintour. Fashion Week venues usually feel antiseptic, but this all-white space and rows of overhanging lights make the venue feel like a hospital room out of Zoolander. A woman holding a glass of red wine leaned against the back wall. She had been there since 4 PM and told me that Real Housewives of New Jersey’s Danielle Staub, a patient of Dr. Kassir’s, had stopped in earlier. “Do you want pictures? I have pictures.” As she fumbled with her Blackberry, her last SMS was visible: dont have time for hope and luck… only do. 😉 She was close to the open bar. A remix of “Goldfinger” started playing. 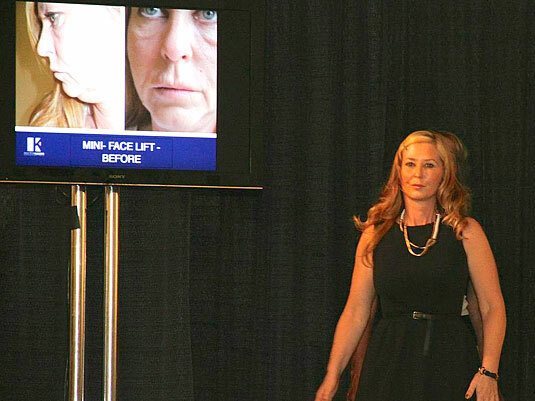 RHINOPLASTY, read the screen as women — mostly in their twenties — walked the runway. The work was generally subtle, but one or two of them had the typical scooped-bridge-upturned-tip popular amongst Jewish girls in Beverly Hills in the 1960s. The surgery on the few men in this category was nowhere near as noticeable, and they looked basically the same as their “before” shots. But then, I’m less conditioned to judge men. I wouldn’t notice a physical change in a male friend unless he lost a limb. Men and women walked arm-in-arm down the runway in the LIPOSUCTION (Justin Timberlake’s “Suit & Tie”) category; these women skewed older than those in the RHINOPLASTY group. One woman in her late forties (lipo, chin lift) strutted down the runway flashing a blue garter, like she was on her way to her wedding. Next up, the ambiguous INJECTIBLES (“Blurred Lines”). The botox and lip augmentation models were exclusively women, and I saw no significant difference in the befores and afters. The face lifts looked avert-your-eyes terrible. Not Dr. Kassir’s fault, just generally the aesthetic result of defying basic laws of gravity. The show also featured less robust categories. A bashful-looking man (EAR TUCK) took a turn down the runway along with a super-confident guy wearing a white suit (CHIN IMPLANT). For the grand finale, a mother and daughter, both of whom compete in beauty pageants and both of whom have gone under Dr. Kassir’s scalpel for multiple procedures, emerged in full sash-and-tiara. From a few paces away they could be the same age, which would thrill any mother’s daughter. 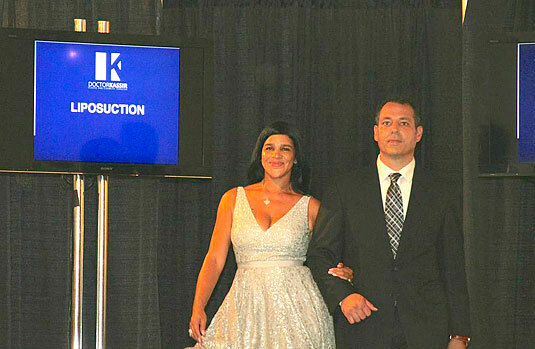 Of course, these models were cast by Dr. Kassir himself — the patients who were willing to walk the runway and put their surgery out there in a celebratory fashion. For each of Dr. Kassir’s “designs” that walked before us, there were probably five who were still trying to convince their friends that they really did have a deviated septum. This show did not feature breast augmentation, although there was enough décolletage in the room to serve as its own little showcase. Dr. Kassir hopes to feature breast augmentation in next season’s lineup.